Finalists in the Girls’ Singles event at the 2009 World Junior Championships in Cartagena de Indias, when an Chinese gold medal contest saw the defensive skills of Wu Yang stand firm against the electric speed of Gu Yuting, both emerged successful in the final round of the Women’s Singles qualification tournament in Shenzhen on the afternoon of Wednesday 30th May. 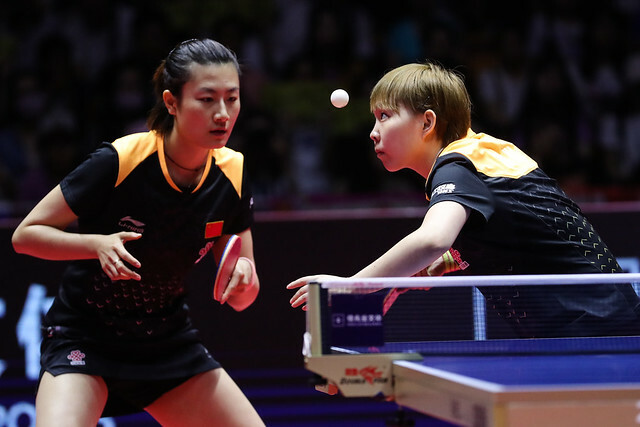 Both reserved places in the Seamaster 2018 ITTF World Tour Platinum, Kaisa China Open. Gu Yuting, now a more measured player than we saw some nine years ago, beat Japan’s Miyu Maeda (9-11, 11-7, 11-6, 11-7, 11-5); at the same time Wu Yang accounted for Romania’s Bernadette Szocs (11-4, 11-8, 11-7, 15-13), the winner earlier in the year at the Europe Top 16 tournament. According to world ranking the win recorded by Wu Yang was the upset of the round; she is named at no.116, Bernadette Szocs at no.33. However, had Wu Yang been subject to greater international exposure in recent months, there is no doubt she would have a much higher status. Whatever the world rankings may relate; Wu Yang is the best female defensive player in the world. Bernadette Szocs has undoubtedly improved against the backspin art but facing Wu Yang, who in the opening round had beaten Indonesia’s Gustin Dwijayanti (11-2, 11-1, 11-6, 11-4), was a different proposition. Impressive from Gu Yuting and Wu Yang; now adjusted, in main draw both could well be players to note.